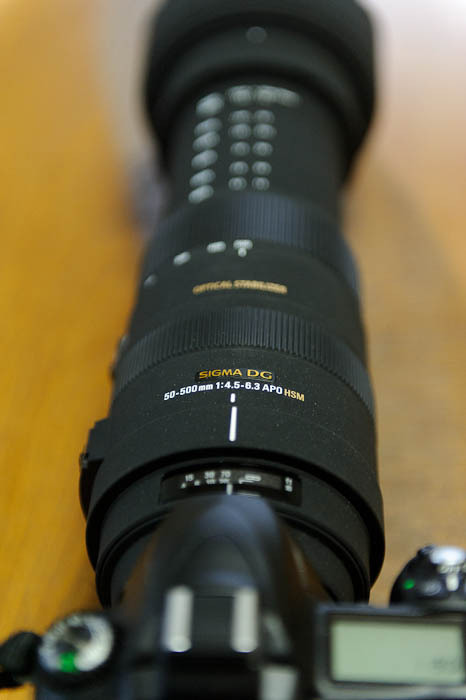 Jeffrey Friedl's Blog » So, Just How Bigma is the Sigma? This continues from Part I and Part II on my new lens. A friend came over and I used his camera either to take some pictures, or to model the lens. The puppies on the hood and under the lens are tiny chopstick holders, seen in my “New Camera” post the other day, and I used the “Mostly Monochrome” Lightroom develop preset seen in my Stupid Tone-Curve Tricks post as the basis for this look. In Part I I was astounded at how huge the lens is, yet, every time I see pictures of it, it doesn't seem that big. A reader (thanks Itano-san) pointed me at the blog of someone who just got The Bigma, and the photos of it on make it look cute. So why was I so astounded at the size? I think one reason I was surprised at the size is because I had seen this cool five-minute video at LensRentals.com showing the sizes of a bunch of large lenses, including the previous (non-stabilized) version of the Sigma Bigma. The guy in the video has massive hands that would make a basketball look like a grape, and is surrounded by HUGE lenses that rightly make The Bigma look like a child's toy. I'm feeling less intimidated now that I'm getting used to it, but wow, I was surprised when it first showed up. It makes me feel like a paparazzi when I'm out with it. Yuck. Not a nice feeling. The feeling is particularly pronounced when bracing the lens against something (railing, telephone pole, etc.) because it looks like you're trying to hide behind something and photograph covertly. The balance places the zoom ring in the perfect spot for gripping with the left hand while holding the camera with the right, but the focus ring is too far back to be reached when holding the lens comfortably, so to manual focus, I have to adjust my grip to one that's less comfortable and less steady. Since I prefer to use manual focus when I can, this is unfortunate. Because the forward/inner barrel extends out from inside the rear/outer barrel, I worry about using this in the rain. It was misting slightly this morning when I was out with it for a bit, and the thought of getting the inner barrel wet then retracting the wetness back into the lens when unzooming scared the heck out of me, so I abandoned the outing. I don't know whether this is a valid concern, but I'll not use The Bigma in the rain until I know for sure. It has a zoom lock to stop the zoom from self-extending due to gravity when you're walking around with the lens pointing down, but I wish you could lock at 200mm as well (the focal length that has the maximum magnification). It does not hold focus while zooming at all. Not even close. You must refocus after adjusting the zoom. f/5.6 is definitely not f/1.2, so pictures like in “Impossible Photography: No Light, No Tripod, No Hope. D700 and a 50mm f/1.2” and “Pushing Lowlight-Photography Limits: The Atta Terrace Hotel at Night” are less likely with The Bigma. The tripod-mount foot has just one screw hole (unlike the Nikkor 70-200VR, which has two), so it could spin in place if not tightened down with considerable force. The bottom of the foot is made of a slightly rubbery material that seems to bite well, so I've not actually experienced any inadvertent twisting (as of this writing, I've used the foot just once, with a monopod), but it's a concern. The optical-stabilization feature causes the view through the viewfinder to “swim” quite a bit at times, much (much!) more than it does with any of the few other VR lenses I've used. It's normally not a problem, but sometimes makes framing very difficult. A few times it (or my Nikon D700) have gotten very confused with each other, and the viewfinder reported that it was at the impossible f/95, and at the same time, autofocus and VR stopped working. Flipping the camera off and on would solve the problem. Uh, this is not the Bigma. The Bigma is the 200-500 f/2.8. This thing is nothing compared to that behemoth. Just to support Jeffrey, the Sigma 50-500mm is what people refer to as the Bigma. If the 200-500mm was practical enough for normal people to own, it might have taken over the nickname, but at $29000 USD and given that you almost need to have a jeep and mount it to a gun turret, the 200-500 f/2.8 is not exactly practical for most people. The “lesser” 50-500mm cousin, however, has long been popular with birding and wildlife photographers, and has long had the “Bigma” moniker. The strange thing is, that Sigma also has a 150-500mm OS, and 120-400mm OS, that you would think would be better in the telephoto ranges since they are less extreme zooms, but for whatever reason, the 50-500mm is the one that always has had the highest regard. Wait- you don’t have a 50mm f1.4? You’re missing out on a lot of fun! Thanks for giving us some shots that show the perspective of the bigma. I was all ready with the insults and ‘player hating’ for your Bigma but then I saw that 50-500mm armor-piercing anti-tank weapon that Sigma is hiding in that green canister. The mouseover to see lens – very cool! That’s just what I was wondering — how big is it? — when I read that you got it. You, of course, answered the question with more precision than anyone else. Back in my newspapering days I used a big 300 f2.8 now and then, but never got good at it. Wow, Jeffrey – I stumbled across this entry randomly, and thought for a bit, because I knew your name sounded familiar. Then it came to me – I used your English Japanese electronic dictionary for years while I was a university student taking Japanese classes! I had no idea that you had a blog or that you were into photography! Just to go further on the first comment (now a year old, I know) – the 50-500mm is the “Bigma.” The 200-500mm f/2.8 has been nicknamed the “Sigmarine” (presumably because the thing looks a bit like a submarine).